Barcelona Photoblog: Barcelona Artists: Drawings or Photos? Barcelona Artists: Drawings or Photos? How many times have you seen these anonymous artists while going for a stroll in big cities like London, Paris, Rome or maybe your own? In Barcelona you may have the chance to have your small photo drawn freehand if you don´t have patience enough to sit and pose while being the center of attention of onlookers. Maybe you are later exhibited in this gallery of famous hollywood actors. 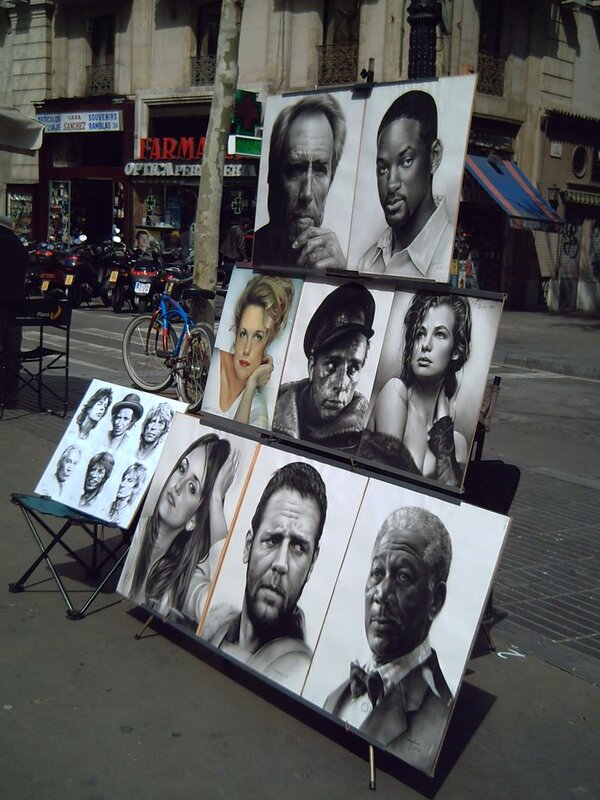 Conclusion: Yet another expression of art to enjoy in Las Ramblas. wow, these really look like photos, whata great sketch artist! * Nicola: Wow, this is difficult. I remember seeing her but not the name, I remembered just one movie! I will try to find out but anyone can give the answer to the quiz here. Be my guest. * Cynthia: I wonder how they do that. I have another picture with the artist at work but I liked this one better. Doesn´t it happen to you all that you make several pictures but it is hard to choose one for the blog? Thanks. That's a really cool photo - love the drawings - amazing, they do look like photos! > Hello Sam it is good you come back. Thanks, I appreciate that you like it. How are things in Montchauvet? It's a great thing to see places such wonderful and rare displays of such great drawings. Simply Superb!